Last night, I sat down on the couch to watch television, only to find that the remote control was on the table behind me – out of my reach. Maybe you can relate to this. You might be wondering what this has to do with compensation planning. Well, let me tell you. Just like a remote control makes the television watching experience more convenient, simplified access to talent information streamlines the compensation planning experience and enables improved decision making. Let me explain. It’s not enough just to have a remote control for your television, it must be within your reach where and when you need it in order to be effective. Similarly, possessing talent data is not enough. When it comes to compensation planning, you must be able to quickly and easily access relevant talent information where and when you need it, such as from the planning worksheet when making compensation decisions. Key talent indicators – high potential, key contributor, critical skill talent, risk of loss, etc. Yet, many planners and decision makers struggle to easily access this information. Current approaches are time consuming and often require scrolling through columns on the compensation worksheet to find the relevant information, and in some cases even navigating away from the compensation planning worksheet to access the information elsewhere. That is why I’m excited to announce that as part of the SAP SuccessFactors Q4 2017 release, we’ve enhanced our Compensation capabilities with simplified access for planners and decision makers to view relevant talent information during compensation planning. With new custom views, planners and decisions makers can more easily access and view comprehensive employee information. Planners no longer have to move away from the page they’re on to find the information they need. Custom views provides simple, one-click access to talent data from other modules directly from the compensation worksheet and executive review sheet. 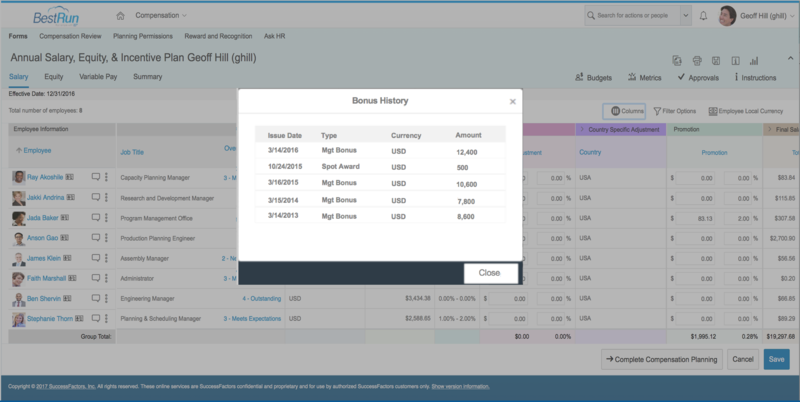 Portlets from the people profile can be accessed from a list menu and appear as pop-up windows on the compensation worksheet. With a single click, custom views provides answers to planners most common questions. For example, compensation planners and managers can more quickly access and view key talent indicators such as risk of loss, critical skill talent, employee compensation and bonus histories, performance rating information and any succession plans that employee is on. With access to an employee’s compensation and bonus history, planners have the contextual information they need to make informed compensation decisions. By seeing what kind of increases an employee has previously received, a planner can ensure that the current recommended merit increase or bonus is sending the intended message to the employee. Our goal in delivering this enhancement is simple – and that’s to better enable compensation planners to make pay decisions on objective fact-based data. Simplified access to relevant employee information helps ensure that your organization’s compensation decisions are sending the intended messages to your employees, such as, rewarding top performers more than average or low performers, ensuring competitive pay of critical skill talent, and aligning rewards to levels of employee performance. 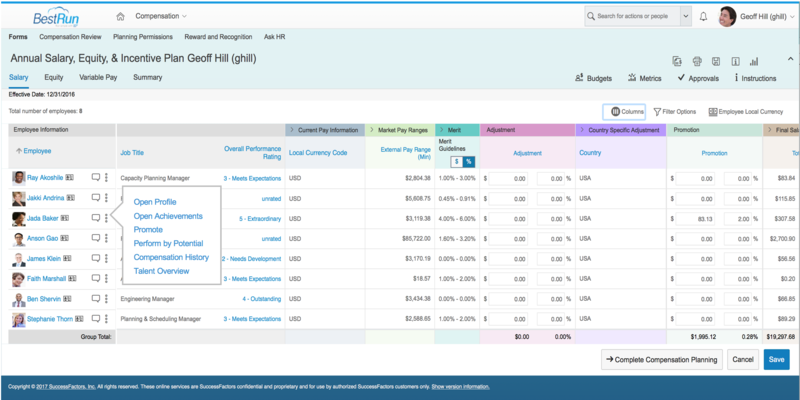 Custom views delivered as part of SAP SuccessFactors Compensation is just one of the many great enhancements you will see in this release. 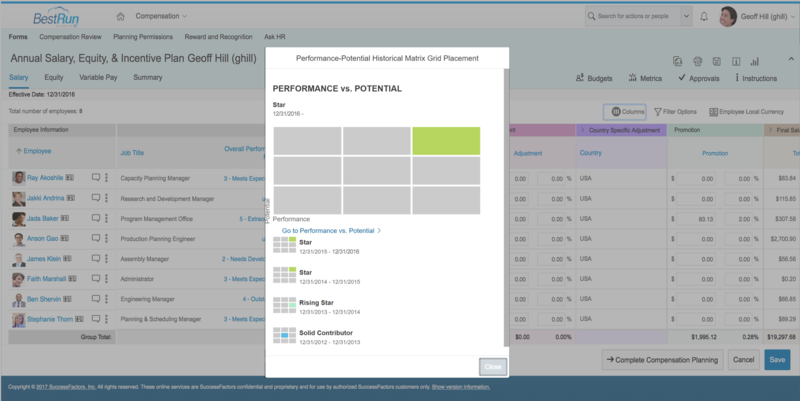 Learn about the new features and enhancements for the full SAP SuccessFactors HCM Suite here. Be sure to check out our Q4 2017 Release Highlights document and hear from our new head of product, Amy Wilson, in our Q4 2017 release video on YouTube. Also for detailed information on the Q4 release, navigate to the product update pages in our SAP SuccessFactors community (registration required). Next SAP Transportation Management 9.5 released!